We’ve traveled a lot with our kids and we know the airplane drill well. But to the passengers of Delta flight 1117 last Wednesday, we looked like new – if greying – parents on baby’s maiden flight (even though it was Timo’s 5th flight). Elisabeth and Catherine were in Florida, and so this trip to Indianapolis to visit Laura’s family was just Three Wise Lee’s (LBL, TRBL, JBL). It wasn’t just that they shut down the x-ray machine on TSA line #4 was because we were taking pictures of Timothy on the security conveyor belt (not recommended), or that I lost my driver’s license, or that we realized as we reached our rental car that we had forgotten part of Timothy’s car seat. It was also that, when the chips were down and the redhead started crying at the start of the flight, we realized that we hadn’t brought many goodies to entertain or feed him. TRBL had us cornered. It may only be a one hour flight from Minneapolis to Indianapolis, but for our fellow passengers, it probably felt about as relaxing as the 12 hour flight that we took to Japan in the smoking section back in the 90’s. Well, Timothy also has two seasons – “Eating and Sleeping”. If Timothy is not sleeping, he is eating, and vice versa. And actually, the eating and sleeping seasons are each preceded by two even more important phases — ‘trying to eat’ and ‘trying NOT to sleep’. Timothy spends most of his waking day scheming ways to get more food in his tummy. As we’ve said, it’s no coincidence that the first Lee family member to sign made it a priority to learn all of the signs that would get him more of the right food (‘more’, ‘please’, ‘don’t even bother putting that orange stuff on my tray’, etc). It’s also no coincidence that much of this lad’s crawling around is aimed toward getting food. When he’s not crawling to his high chair and looking at us with puppy dog eyes, he’s breaking into the cabinet that contains all of his food. Each time he cracks open the door to the food armory, he seems amazed that we still haven’t caught on and moved his eats to higher ground. We’ve put backpacks and chairs in front of the cabinet, but he won’t be deterred. On the sleep side, Timothy has always been a great sleeper. Since the time he was probably three months, he has consistently slept about 2-4 more hours a night than me. And little Red rarely wakes us up in the night. What’s more, he almost always wakes up in a good mood. So once he’s asleep, he’s awesome. But unless he’s super tired, he’s not interested in going to bed. At night, he sees the lights off in his room, hears the humidifier, feels the curtains drawn, and he knows how this movie ends, and he wants no part of it. He loves his bedroom during the day and crawls in there often. But if you carry him into his room, night or day, he thinks he’s destined for his crib and won’t go without a fight. While I appreciate the wee Irishman’s response, you can’t even carry him into his room during the day to read to him without him trying to make a break for the exit. 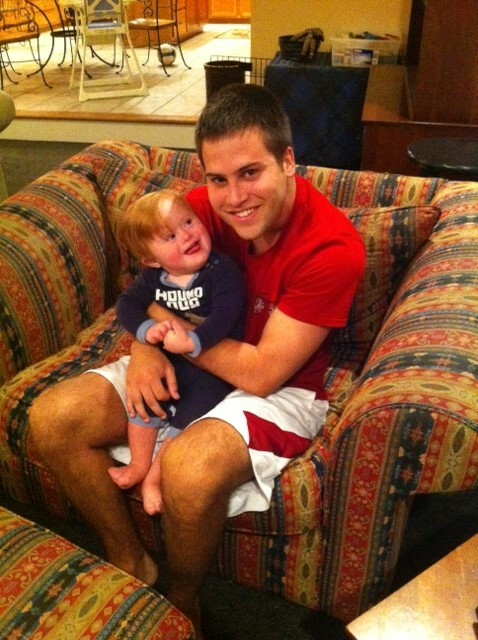 Again, once he’s asleep – total angel – but getting him to sleep is more like dealing with the other side of that ledger. And that was the side of TRBL that made a guest appearance last week on Delta flight 1117. This entry was posted in Communication, Eating, Parenting lessons -- Don't try this at home, Sleep and tagged Sign language, Travel, winter and road construction. Bookmark the permalink. 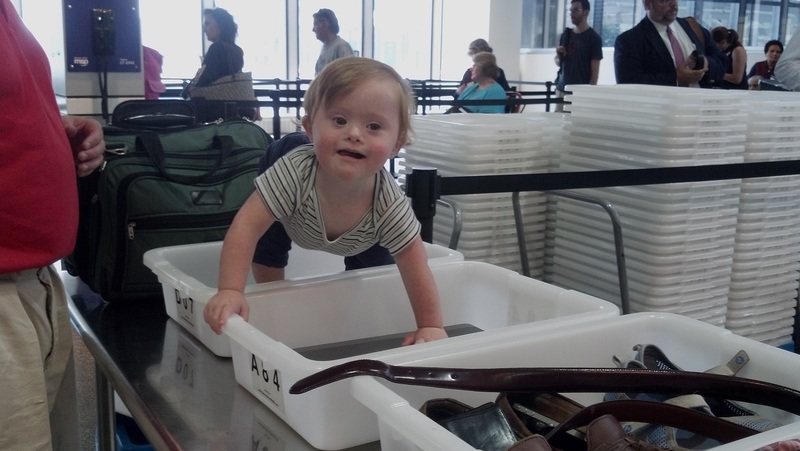 That picture of TRBL in the security screening bin is adorable. Well worth the chastising I’m sure you took from TSA !!! Here’s another very nice Timothy story! I love your writing Jack.